Former GE Mining CEO, Steve Sargent, discusses why adopting a ‘connect and inspire’ leadership style, articulating expected behaviours, and even increasing R&D are keys to success in a disrupted business world. MSD's global CIO, Phyllis Post, describes how the pharmaceutical giant has transformed IT since 2013. 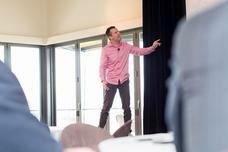 All the action from day 3 of the inaugural ANZ CIO Forum.